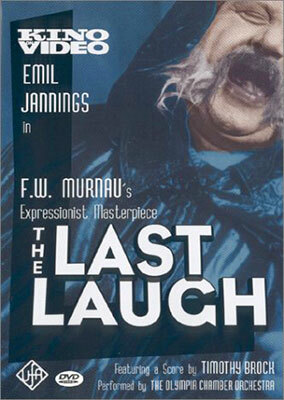 The Last Laugh (1924) is F.W. Murnau’s greatest film second to none, including Sunrise (1927), and stars Germany’s greatest silent era actor, Emil Jannings, in one of his finest and most impressive roles. This film is wonderfully expressionist, and is an even spare but intensely focused film. It surpasses several of the top films that are considered to be Germany’s silent era best. And I think that it would be hard to overstate the importance of The Last Laugh in the history of cinema. 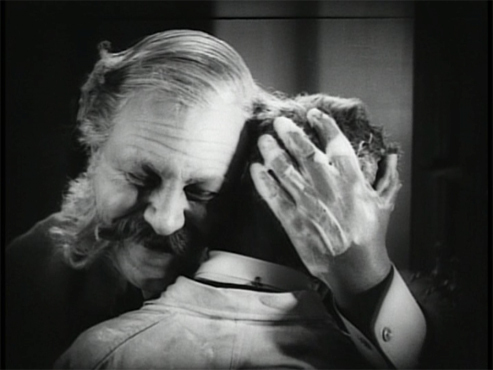 We have here a chance to enjoy an absolutely fantastic performance by Emil Jannings, whose command of his body during his performance is the unmistakable sign of the work of a great artist. The character’s posture, once so upright and proud, changes the moment he sees his replacement and eventually collapses as his pride deflates like a punctured automobile tire. The character becomes almost catatonic. When the uniform coat, the symbol of his position, is being taken off him it is as if it were being wrestled off a corpse. Given the towels, the symbol of his new position, Jannings walks zombie-like as he descends into the men’s washroom, its dark isolation indicative of the darkness that has already crept into his life. He knows he cannot face his family and neighbors, his loss of prestige a great fall among people so easily impressed by the uniform and caring nothing for the man inside. With Jannings bravura performance, it may be easy to lose sight of the fact that F.W. Murnau’s direction is equally fabulous. While the film is virtually told without intertitles, and that is often one of the first achievements of the film that gets noted, dramatic lighting, great camera moves, and hand-held shots all contribute to impressively to the visual language of cinema. The camera tracking in and out, or the effect achieved for the oppressive feeling of the hotel falling on him after Jannings steals back the uniform. The effects are those of Murnau speaking in an experimental and expressionistic visual voice. For one striking shot, Murnau even put the camera on a pulley and rope system that is seen illustrated in still production photos. 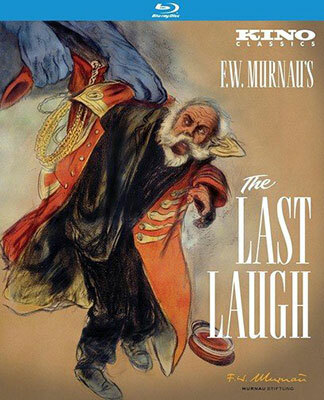 and The Last Laugh (1924) [USA version], black & white, 91 minutes, not rated. Kino Lorber, K21545, UPC 7-38329-21545-3. Two single-sided, dual-layered, Region A Blu-ray Discs, 1.33:1 aspect ratio image in pillarboxed 16:9 (1920 x 1080 pixels) progressive scan AVCHD MPEG-4 format, ? Mbps average video bit rate, ? 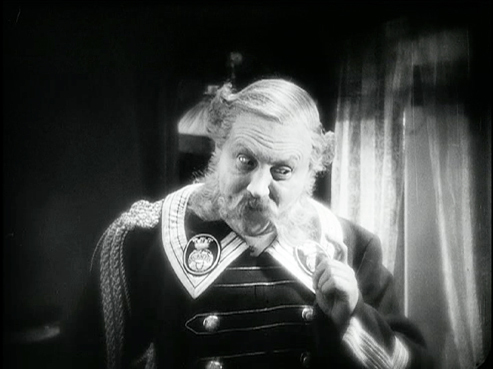 kbps audio bit rate, Dolby Digital 5.1 surround sound (Berklee and Becce scores) and Dolby Digital 2.0 stereo sound (Berklee, Becce and Brock scores), German language intertitles (restoration) and English language intertitles (USA version), optional English language subtitles (restoration), chapter stops; two-disc BD keepcase, $29.95. 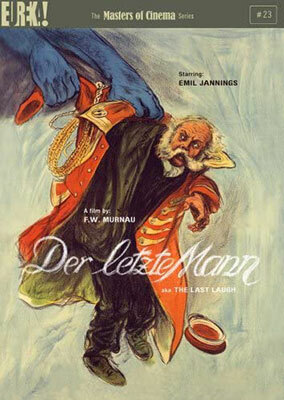 This Blu-ray Disc edition has been mastered at 2K high-resolution from the 2003 restoration by the Friedrich-Wilhelm-Murnau-Stiftung, supervised by Luciano Berriatúa, as compiled from the incomplete German domestic 35mm nitrate camera negative, a 35mm nitrate positive held by the Museum of Modern Art (struck in Germany in 1936), from a fragmentary 35mm German print held by the F.W. Murnau Stiftung, and a print held by the Swiss Cinémathèque. Also featured is the 1925 American release version, with alternate takes and camera angles. The film is presented with optional soundtracks, including a new musical score by the Berklee College of Music’s Berklee Silent Film Orchestra (2017), as well as the original score by Giuseppe Becca, orchestrated by Detlev Glanert and performed by the Saarbrücken Radio Symphony Orchestra (2003) [both for the restoration version], and a music score composed by Timothy Brock and performed by the Olympia [Washington] Chamber Orchestra (2001) [for the American release version]. 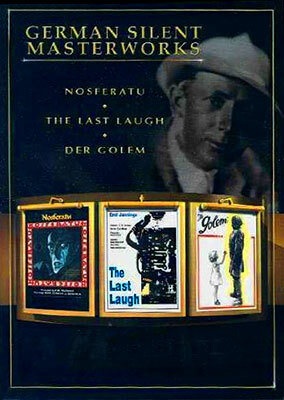 The supplemental material includes audio commentary by film historian Noah Isenberg; and a 40-minute documentary, “The Making of The Last Laugh” by Murnau expert Luciano Berriatúa. USA: Click the logomark to purchase this Region A Blu-ray Disc edition from Amazon.com. Your purchase supports the Silent Era website. Canada: Click the logomark to purchase this Region A Blu-ray Disc edition from Amazon.ca. Your purchase supports the Silent Era website. Kino Lorber, K21543, UPC 7-38329-21543-9. Two single-sided, dual-layered, Region 1 NTSC DVD discs, 1.33:1 aspect ratio image in full-frame 4:3 (720 x 480 pixels) interlaced scan MPEG-2 format, ? Mbps average video bit rate, ? kbps audio bit rate, Dolby Digital 5.1 surround sound (Berklee and Becce scores) and Dolby Digital 2.0 stereo sound (Berklee, Becce and Brock scores), German language intertitles (restoration) and English language intertitles (USA version), optional English language subtitles (restoration), chapter stops; two-disc DVD keepcase, $19.95. This DVD edition has been mastered at 2K high-resolution from the 2003 restoration by the Friedrich-Wilhelm-Murnau-Stiftung, supervised by Luciano Berriatúa, as compiled from the incomplete German domestic 35mm nitrate camera negative, a 35mm nitrate positive held by the Museum of Modern Art (struck in Germany in 1936), from a fragmentary 35mm German print held by the F.W. Murnau Stiftung, and a print held by the Swiss Cinémathèque. Also featured is the 1925 American release version, with alternate takes and camera angles. USA: Click the logomark to purchase this Region 1 NTSC DVD edition from Amazon.com. Your purchase supports the Silent Era website. Canada: Click the logomark to purchase this Region 1 NTSC DVD edition from Amazon.ca. Your purchase supports the Silent Era website. Kino International, K633, UPC 7-38329-06332-0. Two single-sided, dual-layered, Region 1 NTSC DVD discs, 1.33:1 aspect ratio image in full-frame 4:3 (720 x 480 pixels) interlaced scan MPEG-2 format, ? Mbps average video bit rate, ? kbps audio bit rate, Dolby Digital 5.1 surround sound (Becce score) and Dolby Digital 2.0 stereo sound (Becce and Brock scores), German language intertitles (restoration) and English language intertitles (USA version), optional English language subtitles (restoration), chapter stops; two-disc DVD keepcase, $29.95. Release date: 30 September 2008. Ratings (1-10): video: 8 / audio: 8 / additional content: 7 / overall: 8. This two-disc NTSC DVD edition features the 2003 restoration from the F.W. Murnau Stiftung, as supervised by Luciano Berriatúa. Also, included in the set is the USA release version as previously released by Kino on DVD in 2001. This presentation may visually benefit a bit from its reencoding to this new standard-resolution DVD. The restoration version of the film is accompanied by a new orchestral performance of the 1924 Giuseppe Becce score presented in both 5.1 surround and 2.0 stereo sound, as adapted by Detlev Glanert and performed by the Saarbrücken Radio Symphony Orchestra. The USA version is accompanied by music composed by Timothy Brock and performed by the Olympia [Washington] Chamber Orchestra. The supplemental section includes a 40-minute documentary, “The Making of The Last Laugh,” original German title sequences, and a stills gallery. 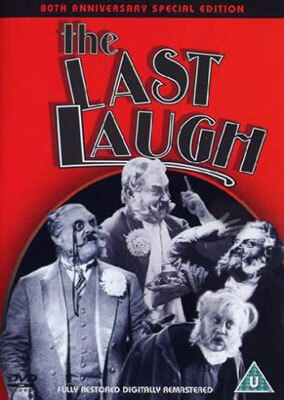 The Last Laugh (1924) [2003 restoration version], black & white, 90 minutes, BBFC Classification U.
Eureka Entertainment, EKA40262 (MoC 23), unknown UPC number. One single-sided, dual-layered, Region 2 PAL DVD disc, 1.33:1 aspect ratio image in full-frame 4:3 (? x ? pixels) interlaced scan MPEG-2 format, ? Mbps average video bit rate, ? kbps audio bit rate, Dolby Digital 2.0 stereo sound, German language intertitles, optional English language subtitles, chapter stops; standard DVD keepcase, £19.99. Release date: 21 January 2008. This PAL DVD edition features a new, progressive-encoded video transfer of the 2003 film restoration version, with improved English-language subtitle translation of the original German-language intertitles. The supplementary material includes a 41-minute documentary by Murnau expert Luciano Berriatúa, and a lavishly-illustrated 36-page booklet with writings by film scholars R. Dixon Smith, Tony Rayns, and Lotte H. Eisner. North American collectors will need a region-free PAL DVD player capable of outputting an NTSC-compatible signal to view this edition. United Kingdom: Click the logomark to purchase this Region 2 PAL DVD edition from Amazon.co.uk. Your purchase supports Silent Era. 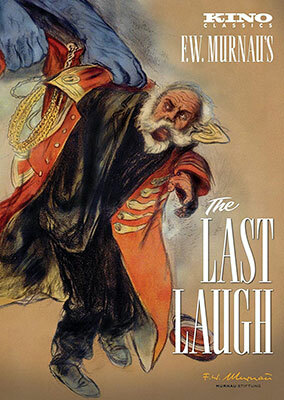 The Last Laugh (1924) [USA version], black & white, 91 minutes, not rated. Kino International, K206, UPC 7-38329-02062-0. One single-sided, dual-layered, Region 0 NTSC DVD disc, 1.33:1 aspect ratio image in full-frame 4:3 (720 x 480 pixels) interlaced scan MPEG-2 format, 5.5 Mbps average video bit rate, 224 kbps audio bit rate, Dolby Digital 2.0 stereo sound, English language intertitles, no foreign language subtitles, 12 chapter stops; standard DVD keepcase, $29.95. Release date: 5 June 2001. Ratings (1-10): video: 7 / audio: 8 / additional content: 7 / overall: 8. This DVD edition is virtually identical to the 1993 Criterion laserdisc, as produced for home video by David Shepard. The video transfer for this DVD has many of the same qualities as previous editions on home video from Criterion and Kino. The source print is a little blasted out in the highlights, and the overall image detail is a little soft. And since I have never seen another print of this film I cannot say whether or not this is how the film has survived. The video transfer here may well be the same as that produced for the 1993 editions. In reevaluating the disc on high-definition equipment with hardware upscaling to a 1080p high-definition signal, the DVD renders a fairly filmlike picture and we stand by our original evaluation of the video quality, but the older video transfer shows its age with a softness of image detail that is only partly due to the standard-definition NTSC transfer and also to the disc’s average bit-rate encoding. Even in 2001, the film could have benefitted from a new video transfer. We’re guessing here, but, the source print appears to be a combination of a German 35mm negative and an English language export print. The main titles are German, yet there are insert shots of a decorated cake, a newspaper clipping, and of the letter of demotion in English. The DVD’s supplementary material contains a exerpt from a German print with the original German directorial-intrusion intertitle explaining the film’s epilogue. Also included are several still and production photographs. A beautiful and appropriately moody score was composed and conducted in 1993 by Timothy Brock. The stereo score, noted as a 2.0 soundtrack, is not discreet and decodes through our review system in pseudo 5.0 surround sound. Honestly, there are a few moments when the members of the Olympia Chamber Orchestra do not quite hit their notes, being a little flat, but not often enough to distract from the film. Any advance buzz about this disc having DVD mastering problems that you may have heard was correct, but those problems were cleared up before the final release of the DVD. You can purchase this disc with confidence. And we highly recommend this masterpiece of world cinema to anyone. The Last Laugh is a film well worth discovering for yourself, in a reasonably priced DVD edition that is well worth owning. 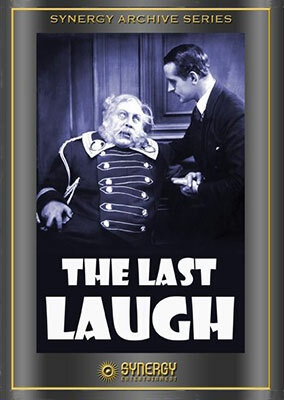 The Last Laugh (1924), black & white, 90 minutes, BBFC Classification U.
Eureka Entertainment, EKA40073, unknown UPC number. Two single-sided, dual-layered?, Region 2 PAL DVD discs, 1.33:1 aspect ratio image in full-frame 4:3 (? x ? pixels) interlaced scan MPEG-2 format, ? Mbps average video bit rate, ? kbps audio bit rate, Dolby Digital 5.1 surround sound and Dolby Digital 2.0 stereo sound, English language intertitles, no foreign language subtitles, chapter stops; standard DVD keepcase, £22.99. Release date: 23 February 2004. This PAL DVD edition also contains a documentary, historical information and biographies. The film is accompanied by a modern music score. including The Last Laugh (1924), black & white, ? minutes, not rated. Triton Multimedia, unknown catalog number, unknown UPC number. One single-sided, dual-layered, Region 1 NTSC DVD disc, 1.33:1 aspect ratio image in full-frame 4:3 (720 x 480 pixels) interlaced scan MPEG-2 format, ? Mbps average video bit rate, ? kbps audio bit rate, Dolby Digital 2.0 mono? sound, English language intertitles, no foreign language subtitles, chapter stops; standard DVD keepcase, $9.99. Release date: 16 October 2001. We have not viewed this DVD edition. And we do not know whether 35mm or 16mm reduction print materials were utilized in the preparation of this edition. We cannot recommend this edition at this time. 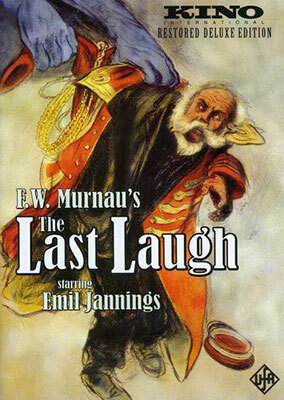 The Last Laugh (1924), black & white, ? minutes, not rated. Synergy Entertainment, unknown catalog number, unknown UPC number. One single-sided, dual-layered, Region 0 NTSC DVD-R disc, 1.33:1 aspect ratio image in full-frame 4:3 (720 x 480 pixels) interlaced scan MPEG-2 format, ? Mbps average video bit rate, ? kbps audio bit rate, Dolby Digital 2.0 mono? sound, English language intertitles, no foreign language subtitles, chapter stops; standard DVD keepcase, $9.99. Release date: 12 November 2007. We have not viewed this DVD-R edition. A 16mm reduction print of the 1925 American release version of the film was likely utilized in the preparation of this edition. We do not recommend this edition at this time. Other F.W. MURNAU films available on home video. Other silent era EMIL JANNINGS films available on home video. Other GERMAN FILMS of the silent era available on home video.